Osteochondroma is a benign, cartilaginous neoplasm that is found in any bone that undergoes enchondral bone formation in its development. The World Health Organization (WHO) defines osteochondroma as a cartilage-capped bony projection on the external surface of a bone. It is found most commonly around the knee and the proximal humerus; however, it can occur in any bone. Osteochondroma is the most common benign bone tumor. Osteochondromas account for approximately 35% of benign bone tumors and 9% of all bone tumors. Most are asymptomatic, but they can cause mechanical symptoms depending on their location and size. Historically and currently, most osteochondromas are incidental findings and are treated solely with observation. If they remain asymptomatic, they can be ignored. Lesions that create mechanical symptoms, become painful, begin to enlarge, or cause growth disturbance have historically been treated with surgical removal, and this remains the mainstay of treatment. Biologic therapies for osteochondromas may be possible in the future. Osteochondromas can occur in many different locations in the body. Thus, a complete understanding of local anatomy is paramount to ensure that local structures are not harmed during surgical resection. Because these lesions arise from the metaphysis, particular care must be taken to avoid damage to the growth plate in the skeletally immature patient. Osteochondroma is a hamartoma, and patients most commonly present in the second decade of life. Osteochondromas are located adjacent to growth plates and develop away from the growth plate with time because they are essentially isolated growth plates. They are affected by, and respond to, various growth factors and hormones in the same manner as epiphyseal growth plates. Osteochondromas grow until skeletal maturity; growth generally stops once the growth plates fuse. Slow growth from the cap may continue over time, as described by Virchow, but this usually stops by age 30 years. Although the exact etiology of these growths is not known, a peripheral portion of the physis is thought to herniate from the growth plate. This herniation may be idiopathic or may be the result of trauma or a perichondrial ring deficiency. Whatever the cause, the result is an abnormal extension of metaplastic cartilage that responds to the factors that stimulate the growth plate and thus results in exostosis growth. This island of cartilage organizes into a structure similar to the epiphysis (see Histologic Findings). As this metaplastic cartilage is stimulated, enchondral bone formation occurs, developing a bony stalk. The histology of the cartilage cap reflects the classic defined zones observed in the growth plate—namely, proliferation, columniation, hypertrophy, calcification, and ossification. This theory is thought to explain the classic finding of the osteochondroma associated with a growth plate and growing away from the physis while maintaining its medullary continuity. The theory is also thought to explain the clinical behavior of the exostosis growing only until skeletal maturity. Heinritz et al reported on the clinical findings and results of molecular analyses of the EXT1 and EXT2 genes—mutations of which lead to multiple osteochondroma—in 23 patients. In 17 of the 23 patients, novel pathogenic mutations were identified (11 in the EXT1 gene; six in the EXT2 gene). According to the authors, findings of this study extend the mutational spectrum and understanding of the pathogenic effects of EXT1 and EXT2 mutations. Solitary osteochondroma. 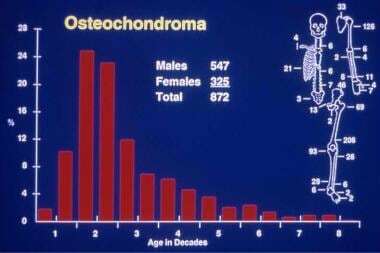 Anatomic and age distribution of solitary osteochondromas. Ostensen H, Pettersson H, Davies AM, et al. The WHO manual of diagnostic imaging: radiographic anatomy and interpretation of the musculoskeletal system. World Health Organization. Available at http://apps.who.int/iris/bitstream/10665/42457/1/9241545550_eng.pdf?ua=1. 2002; Accessed: May 30, 2017. Garrison RC, Unni KK, McLeod RA, Pritchard DJ, Dahlin DC. Chondrosarcoma arising in osteochondroma. Cancer. 1982 May 1. 49(9):1890-7. [Medline]. Staals EL, Bacchini P, Mercuri M, Bertoni F. Dedifferentiated chondrosarcomas arising in preexisting osteochondromas. J Bone Joint Surg Am. 2007 May. 89(5):987-93. [Medline]. Akahane T, Shimizu T, Isobe K, Yoshimura Y, Kato H. Dedifferentiated chondrosarcoma arising in a solitary osteochondroma with leiomyosarcomatous component: a case report. Arch Orthop Trauma Surg. 2008 Sep. 128 (9):951-3. [Medline]. Mavrogenis AF, Papagelopoulos PJ, Soucacos PN. Skeletal osteochondromas revisited. Orthopedics. 2008 Oct. 31 (10):[Medline]. Nogier A, De Pinieux G, Hottya G, Anract P. Case reports: enlargement of a calcaneal osteochondroma after skeletal maturity. Clin Orthop Relat Res. 2006 Jun. 447:260-6. [Medline]. D'Ambrosia R, Ferguson AB Jr. The formation of osteochondroma by epiphyseal cartilage transplantation. Clin Orthop. 1968 Nov-Dec. 61:103-15. [Medline]. Hameetman L, Szuhai K, Yavas A, Knijnenburg J, van Duin M, van Dekken H, et al. The role of EXT1 in nonhereditary osteochondroma: identification of homozygous deletions. J Natl Cancer Inst. 2007 Mar 7. 99(5):396-406. [Medline]. Hecht JT, Hogue D, Strong LC, et al. Hereditary multiple exostosis and chondrosarcoma: linkage to chromosome II and loss of heterozygosity for EXT-linked markers on chromosomes II and 8. Am J Hum Genet. 1995 May. 56(5):1125-31. [Medline]. Coughlan B, Feliz A, Ishida T, Czerniak B, Dorfman HD. p53 expression and DNA ploidy of cartilage lesions. Hum Pathol. 1995 Jun. 26(6):620-4. [Medline]. Legeai-Mallet L, Margaritte-Jeannin P, Lemdani M, et al. An extension of the admixture test for the study of genetic heterogeneity in hereditary multiple exostoses. Hum Genet. 1997 Mar. 99(3):298-302. [Medline]. Legeai-Mallet L, Munnich A, Maroteaux P, et al. Incomplete penetrance and expressivity skewing in hereditary multiple exostoses. Clin Genet. 1997 Jul. 52(1):12-6. [Medline]. Park KJ, Shin KH, Ku JL. Germline mutations in the EXT1 and EXT2 genes in Korean patients with hereditary multiple exostoses. J Hum Genet. 1999. 44(4):230-4. [Medline]. Heinritz W, Hüffmeier U, Strenge S, Miterski B, Zweier C, Leinung S, et al. New mutations of EXT1 and EXT2 genes in German patients with Multiple Osteochondromas. Ann Hum Genet. 2009 May. 73:283-91. [Medline]. Kitsoulis P, Galani V, Stefanaki K, Paraskevas G, Karatzias G, Agnantis NJ, et al. Osteochondromas: review of the clinical, radiological and pathological features. In Vivo. 2008 Sep-Oct. 22(5):633-46. [Medline]. Chin KR, Kharrazi FD, Miller BS, Mankin HJ, Gebhardt MC. Osteochondromas of the distal aspect of the tibia or fibula. Natural history and treatment. J Bone Joint Surg Am. 2000 Sep. 82(9):1269-78. [Medline]. Florez B, Mönckeberg J, Castillo G, Beguiristain J. Solitary osteochondroma long-term follow-up. J Pediatr Orthop B. 2008 Mar. 17(2):91-4. [Medline]. Di Giorgio L, Lanzone R, Sodano L, Di Paola B, Touloupakis G, Mastantuono M. [Surgical treatment of osteochondromas: indication in "Strategic Exostosis"]. Clin Ter. 2015 Jan-Feb. 166(1):e27-e33. [Medline]. Bakhshi H, Kushare I, Murphy MO, Gaynor JW, Dormans JP. Chest wall osteochondroma in children: a case series of surgical management. J Pediatr Orthop. 2014 Oct-Nov. 34(7):733-7. [Medline]. Fogel GR, McElfresh EC, Peterson HA, Wicklund PT. Management of deformities of the forearm in multiple hereditary osteochondromas. J Bone Joint Surg Am. 1984 Jun. 66(5):670-80. [Medline]. Govender S, Parbhoo AH. Osteochondroma with compression of the spinal cord. A report of two cases. J Bone Joint Surg Br. 1999 Jul. 81(4):667-9. [Medline]. Peterson HA. Multiple hereditary osteochondromata. Clin Orthop. 1989 Feb. (239):222-30. [Medline]. Porter DE, Benson MK, Hosney GA. The hip in hereditary multiple exostoses. J Bone Joint Surg Br. 2001 Sep. 83(7):988-95. [Medline]. Snearly WN, Peterson HA. Management of ankle deformities in multiple hereditary osteochondromata. J Pediatr Orthop. 1989 Jul-Aug. 9(4):427-32. [Medline]. Wuyts W, Ramlakhan S, Van Hul W. Refinement of the multiple exostoses locus (EXT2) to a 3-cM interval on chromosome 11. Am J Hum Genet. 1995 Aug. 57(2):382-7. [Medline]. Wicklund CL, Pauli RM, Johnston D. Natural history study of hereditary multiple exostoses. Am J Med Genet. 1995 Jan 2. 55(1):43-6. [Medline]. Galasso O, Mariconda M, Milano C. An enlarging distal tibia osteochondroma in the adult patient. J Am Podiatr Med Assoc. 2009 Mar-Apr. 99(2):157-61. [Medline]. Coenen L, Biltjes I. High radial nerve palsy caused by a humeral exostosis: a case report. J Hand Surg [Am]. 1992 Jul. 17(4):668-9. [Medline]. Mnif H, Koubaa M, Zrig M, Zammel N, Abid A. Peroneal nerve palsy resulting from fibular head osteochondroma. Orthopedics. 2009 Jul. 32(7):528. [Medline]. Boyacioğlu K, Kayalar N, Sarioğlu S, Yildizhan I, Mert B, Erentuğ V. Popliteal artery pseudoaneurysm associated with solitary osteochondromatosis. Vascular. 2014 Aug. 22 (4):286-9. [Medline]. Sakata T, Mogi K, Sakurai M, Nomura A, Fujii M, Takahara Y. Popliteal Artery Pseudoaneurysm Caused by Osteochondroma. Ann Vasc Surg. 2017 May 4. [Medline]. Raherinantenaina F, Rakoto-Ratsimba HN, Rajaonanahary TM. Management of extremity arterial pseudoaneurysms associated with osteochondromas. Vascular. 2016 Dec. 24 (6):628-637. [Medline]. Fukushi R, Emori M, Iesato N, Kano M, Yamashita T. Osteochondroma causing cervical spinal cord compression. Skeletal Radiol. 2017 Mar 23. [Medline]. Raswan US, Bhat AR, Tanki H, Samoon N, Kirmani AR. A solitary osteochondroma of the cervical spine: a case report and review of literature. Childs Nerv Syst. 2017 Jun. 33 (6):1019-1022. [Medline]. Veeravagu A, Li A, Shuer LM, Desai AM. Cervical Osteochondroma Causing Myelopathy in Adults: Management Considerations and Literature Review. World Neurosurg. 2017 Jan. 97:752.e5-752.e13. [Medline]. Hudson TM, Springfield DS, Spanier SS, et al. Benign exostoses and exostotic chondrosarcomas: evaluation of cartilage thickness by CT. Radiology. 1984 Sep. 152(3):595-9. [Medline]. Purandare NC, Rangarajan V, Agarwal M, Sharma AR, Shah S, Arora A, et al. Integrated PET/CT in evaluating sarcomatous transformation in osteochondromas. Clin Nucl Med. 2009 Jun. 34(6):350-4. [Medline]. Lange RH, Lange TA, Rao BK. Correlative radiographic, scintigraphic, and histological evaluation of exostoses. J Bone Joint Surg Am. 1984 Dec. 66(9):1454-9. [Medline]. Robinson D, Hasharoni A, Oganesian A, et al. Role of FGF9 and FGF receptor 3 in osteochondroma formation. Orthopedics. 2001 Aug. 24(8):783-7. [Medline]. Karasick D, Schweitzer ME, Eschelman DJ. Symptomatic osteochondromas: imaging features. AJR Am J Roentgenol. 1997 Jun. 168(6):1507-12. [Medline]. El-Khoury GY, Bassett GS. Symptomatic bursa formation with osteochondromas. AJR Am J Roentgenol. 1979 Nov. 133(5):895-8. [Medline]. Day FN, Ruggieri C, Britton C. Recurrent osteochondroma. J Foot Ankle Surg. 1998 Mar-Apr. 37(2):162-4; discussion 173. [Medline]. Rajappa S, Kumar MM, Shanmugapriya S. Recurrent solitary osteochondroma of the metacarpal: a case report. J Orthop Surg (Hong Kong). 2013 Apr. 21(1):129-31. [Medline]. Ohnishi T, Horii E, Shukuki K, Hattori T. Surgical treatment for osteochondromas in pediatric digits. J Hand Surg Am. 2011 Mar. 36(3):432-8. [Medline]. Kim JI, Kwon JH, Park YJ, D'Almeida VR, Soni SM, Nha KW. Arthroscopic Excision of Solitary Intra-articular Osteochondroma of the Knee. Knee Surg Relat Res. 2013 Mar. 25(1):36-9. [Medline]. [Full Text]. Fageir MM, Edwards MR, Addison AK. The surgical management of osteochondroma on the ventral surface of the scapula. J Pediatr Orthop B. 2009 Nov. 18 (6):304-7. [Medline]. Humbert ET, Mehlman C, Crawford AH. Two cases of osteochondroma recurrence after surgical resection. Am J Orthop. 2001 Jan. 30(1):62-4. [Medline]. Solitary osteochondroma. Anteroposterior radiograph of a pedunculated osteochondroma of the distal femur. Solitary osteochondroma. Lateral radiograph of a pedunculated osteochondroma of the distal femur. Orientation is away from the growth plate, and medullary continuity is clear. Solitary osteochondroma. Lateral radiograph of a sessile osteochondroma of the distal femur. Solitary osteochondroma. CT scan of the pelvis depicting a massive solitary osteochondroma. Solitary osteochondroma. Anteroposterior radiograph of sessile osteochondroma of the humerus. Solitary osteochondroma. CT scan of the same sessile osteochondroma of the humerus as in Image 6. Solitary osteochondroma. MRI of sessile osteochondroma of the femur demonstrating the thickness of the cartilage cap. Solitary osteochondroma. Gross osteochondroma specimen at the time of resection. Bone stalk and overlying membrane on cartilage cap. Solitary osteochondroma. Cut surface of surgical osteochondroma specimen. Cartilage cap and underlying bone with medullary continuity. Solitary osteochondroma. Histology of cut osteochondroma specimen. Cartilage cap and orientation of enchondral bone formation. Solitary osteochondroma. High-power view of benign cartilage cells arranged in vertical growth plate pattern. Solitary osteochondroma. Radiograph demonstrating the deformation of the distal tibiofibular joint in a patient with a solitary osteochondroma.